Introduction: "You know this giant hulking beast that we all acknowledge is a Very Important Problem Or Question In Our Field? Well, I'm solving it. Er. A very small chunk of it. Smaller. Um... smaller... and.... and... narrowing down on my incredibly tiny... little... specific... contribution... AHA! Yes. Yes, this is my research question." 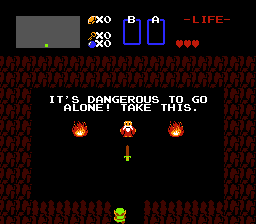 Lit review: "It's dangerous to go alone! Take this!" In other words, what do you need to know as background before you can understand the work I did? I think of this section as putting tools into the reader's backpack... or, if I want a cooler mental image, the "I know Kung Fu" moment from the Matrix. Methods: "Let me tell you what I did." Results: I MADE A THING! I would also like to state, for the record, that I am fighting the temptation to open a subsection of my lit review with BuzzFeed-style headers. "Here are 5 great tools for understanding complex human narratives. #3 will blow your mind." "She thought she had successfully catalogued all possible perspectives on the topic from a neutral point of view. You won't believe what happens next." work, the doctor, places of worship, friends’ houses, and wherever else they need or want to go to live their lives. Disabled people rely on public paratransit to do exactly that. On Monday, the MBTA will discuss drastically cutting “The RIDE,” Boston’s paratransit services. Cutting this would strand our neighbors, friends, and family members without an affordable and reliable way to get around their own communities. This is not okay, and we need to tell that to the MBTA. Call Governor Baker at (617) 725-4005 to voice your opposition to paratransit cuts -- I’ve provided a call script at the end of this post, along with alternative ways to be a disability advocate on this matter. Paratransit is a public transit provision for disabled people who are unable to use fixed-route transit like buses and trains. It is a federal requirement under the Americans with Disabilities Act (see Subpart F of this document for details). Boston’s paratransit service, “The RIDE,” is run by the MBTA. It is intended as a safety net to ensure that everyone is able to get where they need to go. For example, someone with vertigo or chronic fatigue might not be able to walk a mile to the nearest bus stop. Elevator repairs might temporarily block wheelchair users from entering the subway station that takes them to school. On these or other occasions, The RIDE provides door-to-door transit in a shared van. Using The RIDE isn’t free or easy. You have to pass an in-person interview/screening, reserve your ride 1-14 days in advance, and pay $3 per trip. You have to be ready to go 5 minutes before your pick-up time and willing to wait up to 15 minutes after, although in practice it’s sometimes much more than that. Missing or being late for rides incurs penalties, including losing your transit privileges. In contrast, able-bodied people who miss one train… simply wait for the next one. It is not perfect, but it’s better than nothing, and is often the only transit option for disabled people, many of whom live on limited incomes. What are the proposed cuts and why are they being proposed? In Boston, especially along the Green Line, it’s easy to live or work somewhere that’s more than ¾ of a mile from a transit stop. Plenty of able-bodied people walk farther than that to reach transit, so it’s an unfair standard to apply to paratransit riders. Disabled people living on fixed incomes may need to live far from public transit in order to afford rent. Disabled people also go home to suburban families for the holidays, take their wheelchairs to church, and need to go grocery shopping. The cuts would eliminate a lot of rides for a lot of disabled people. Additionally, paratransit isn’t just a substitute for buses and trains. It’s also a way for cities to compensate for not having enough accessible cabs. In the town where I work, there are no accessible cabs. Zero. Ride-sharing services like Uber and Lyft also have a dearth of wheelchair-accessible options in Boston. So paratransit is the only way a wheelchair-using colleague could get to my office. What would happen if the paratransit cuts are passed? First of all, current paratransit riders wouldn’t be able to go to work, church, home, school, see their families and friends… their independence will dramatically decrease. This is not because their capabilities have decreased -- but rather because their society’s willingness to let them use those capabilities has decreased. Right now, paratransit users can take care of many things themselves, just like other adults. Without paratransit, they’ll be forced to rely on others to get to doctors, acquire food and medicine, go to work, and reach places with human company. We will have chosen to leave them trapped and isolated in their homes. Paratransit cuts don’t just affect disabled riders. They affect their families and friends, colleagues and neighbors too -- the whole community. I am an able-bodied transit rider who lives in the city close to a T stop. My grandma lives in a different city and now uses a wheelchair. If paratransit services had been cut at the time of my cousin’s high school graduation, I would have to decide between skipping graduation and staying in the city with my grandma, or leaving my grandmother alone while the rest of our family went to the graduation ceremony. There would be no way for my grandma to get to her granddaughter’s school, and that would be terrible for all of us, not just my grandma. More recently, I hosted a weeklong microresidency at Olin College (my workplace and alma mater) with my friend and engineering colleague Ian Smith. Every morning, Ian took paratransit to campus and we would spend the day hosting workshops, visiting classes, consulting with student project teams, and trying (unsuccessfully) to teach me Ruby on Rails. Every evening, our geeky linguistics-and-life conversations would be cut short by Ian’s phone alerting us that paratransit had arrived to take him back to his hotel. Students are still coming up to me and thanking me for the impact the microresidency had on them. Without paratransit, there would be no visiting Ian. No microresidency. These examples are told from a highly biased perspective. Yes, I could probably afford a one-time wheelchair taxi ride for my grandmother -- but I am relatively privileged, well-educated, middle-class, healthy, and stably-employed young person. If we expect a paratransit rider to take cabs to work, they often won’t be able to afford getting to work. As an able-bodied person, I can get from my home in the city to my job in the suburbs for $2.10 of public transit and a hike on foot. The same journey would be around $60 for a one-way taxi ride. That’s $120 just to get to work and back for one day, or over 13 hours of work at minimum wage -- assuming an 8-hour workday, your transit would cost almost twice as much as the entire salary you’d make. If you prefer to use a web form, you can send the same message via a web form at http://www.mass.gov/governor/constituent-services/contact-governor-office. Note that phone calls are usually viewed as more impactful than web submissions -- but I’m deaf, so I’m putting this option in there. If you are able to attend the transit hearing, go and make sure the people running the meeting know you are there in support of paratransit. It is on Monday, December 14, at 1:00pm in the MassDOT Board Room, 10 Park Plaza, Boston, MA 02116. Right now it is listed as being in the conference rooms on the 2nd floor, but rumor has it that it might move to the 3rd floor. There will be a period for public comment, and if you wish to speak, you can say a similar phrase to the phone call or email above. Make sure to listen to the stories of actual paratransit users -- make sure their stories get heard. Use your voice to boost their voices. Finally, spread the word to your friends and colleagues and encourage them to call the governor, attend the hearing, and let the MBTA know that we will not accept a community where our disabled family members and friends are left stranded. Boston is a beautiful city; I’m proud to live here, and it’s one of my favorite places to explore. Let’s make sure everyone keeps being able to explore it. Thanks to Ian Smith, Abby Rahn, and Eric VanWyk for helping with this blog post.